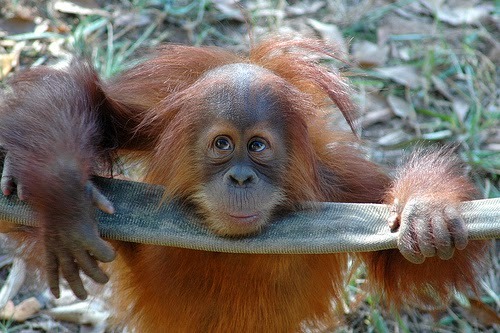 A few years ago, I visited the zoo with friends. As we crowded at the monkey cage in fascination, I recalled an earlier incident. I was on the subway in Beijing, lost in thought, when a woman started talking to her toddler: “Look, the foreigner has two eyes just like you…Look, the foreigner has a nose just like you…” I felt like a monkey in the zoo. In The Gift of the Stranger, the authors describe what could be tweeted “#loveyourneighbor.” They propose that the primary job of language teachers is to help students become good strangers and good hosts, a blessing when visiting another country and gracious hosts at home. Perhaps, no matter what we teach, our most important job is helping students navigate a morally complicated world. 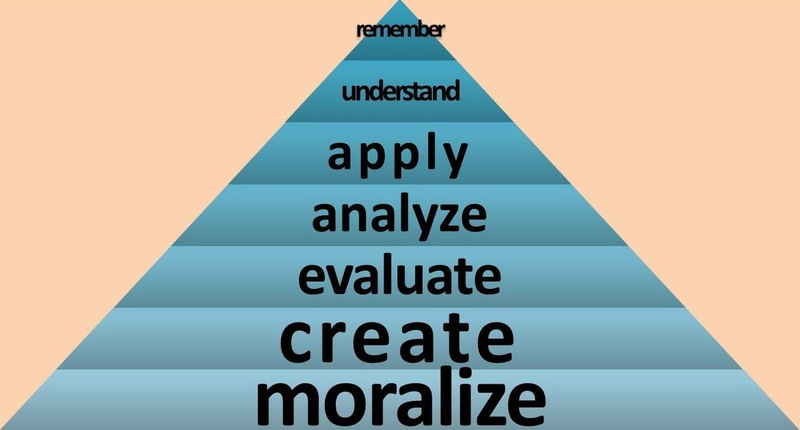 I propose that Bloom’s Taxonomy go deeper into a moral dimension, a potential seventh level, where learners combine information with experiences in order to make and act on moral decisions. (See my additions here: Bloom’s Taxonomy Plus.) Let me explain by clarifying what moralizing is not. Moralizing is not random. Rather it fits into the curriculum or lesson for the day. In a unit focused around the meaning of names, for example, students may design and name a humanitarian project. Early on in my methodology course when learner-centered teaching comes up, I read The Giving Tree to my students and start an ongoing discussion about responsible teaching. Moralizing takes our curriculum farther and deeper, but it doesn’t veer off course. Moralizing is not telling, but helping learners come to their own conclusions, as a colleague voiced, “I don’t want to tell my students not to smoke; I want them to decide for themselves.” We may play devil’s advocate or challenge them to consider a counter perspective. What we don’t do is criticize or belittle, sensitive to the weight of our words. Moralizing is not free rein to talk about God or the Bible or share our faith in the classroom. Rather it’s giving learners tools to make wise decisions about right and wrong, regulate their behavior, and take action. We may broaden their view with a personal experience, proverb, or quote. What we don’t do is pressure or dictate, aware of the influence we wield as teachers. Moralizing does not necessarily reach a conclusion. It often starts at a human level where we grow respect for others no matter the shape of their nose, and we ask students, for example, to regulate their behavior toward family members, strangers, or people with disabilities. However, human level or deeper, we can’t force change. Sometimes, we simply clear the path and then send them on alone with a question for reflection or an assignment to ask a parent or mentor. A frequent complaint from my university colleagues is that their teaching has no point because their students are unlikely to use English in the future. Moralizing with each unit in their textbooks resonates with these teachers and in fact with most teachers I’ve encountered no matter their background or beliefs. Why? Because it gives them license to teach the human beings, not simply the students, in their classrooms. It allows them to help learners acquire subject matter they may use while preparing them for life they will live. On another trip to Beijing, this time in a grocery store, I noticed people were staring at my companion because of her disability more than me, the conspicuous white-haired foreigner. When I commented, she replied, “People stare at me a lot, but I just smile back.” That day in a vegetable-adorned classroom, the Master Teacher used a model of right behavior to plumb the moral dimension and show how a Lamb before His shearers is silent as is a monkey in a cage. I still have a long way to go from snarky to sweet, but maybe someday I’ll be able just to smile back. Sometimes, often, a model speaks louder than words. David I. Smith & Barbara Carvill (2000), The Gift of the Stranger, Eerdmans. Does a seventh moralizing level resonate with you? Why or why not? What ideas do you have for going into the moral dimension in your teaching? How has the Master Teacher taken you into the moral dimension recently? Melissa, I like what you wrote about moralizing: “it gives them license to teach the human beings, not simply the students, in their classrooms. It allows them to help learners acquire subject matter they may use while preparing them for life they will live.” And I believe that most of the teachers I work with would find this a very satisfying direction to take in their classes since many of their students are not likely to use English beyond the required university classes. Adding moralizing to lessons, however, will take some training, at least self-awareness. As you wrote, “Moralizing is not telling, but helping learners come to their own conclusions.” Do we notice that we are answering the deeper questions for students? Do we steer the conversation to land at our opinion of the question? This 7th level, as you describe it, asks us to trust the work of the HS in the hearts of our students. It asks us to be interested questioners and listeners so that we might learn what our students think and build future lessons from there. I have been reluctant to enter this level too much fearing that students will not engage because they lack the language. But your example of giving one word to describe the meaning of the story expresses deeper understandings without complex language. Thanks for triggering my thinking on this topic. 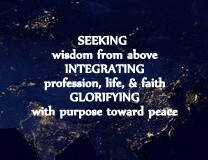 This entry was posted on June 4, 2014 by LEAPAsia in bloom's taxonomy, critical thinking, Melissa K. Smith, moral dimension, Yahweh's wisdom.